I was going to make baked ziti last night but realized I had bought cottage cheese instead of ricotta. I also noticed that I had penne pasta instead of ziti. The pasta type really didn’t matter, since they are very similar. However, I was worried that I wouldn’t like the results using cottage cheese. 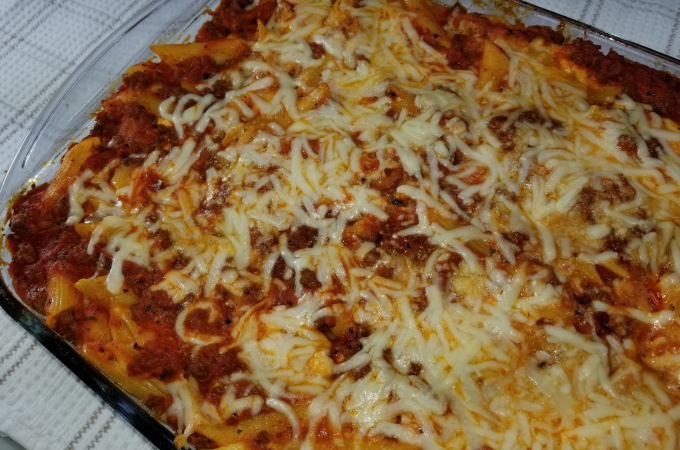 I went ahead and looked up similar baked penne pasta dishes and noticed that many do use cottage cheese instead and the recipe came out fine. My family loved it as well, and even better, I have plenty of leftovers for tonight! You will easily get 8 servings out of this recipe. 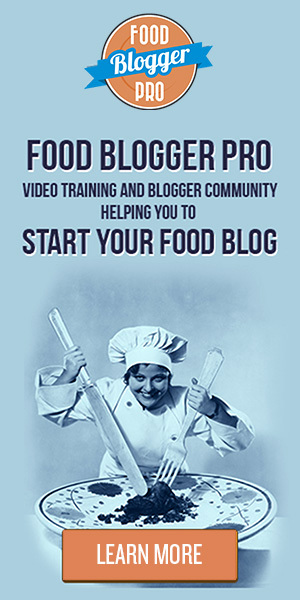 Of course, you can use ricotta if you want to and I will most likely use ricotta next time and update this post to let you know which way we prefer. This recipe is also easy to customize. I used ground beef but it would also be great with Italian sausage. You could also leave out the meat for a vegetarian option. 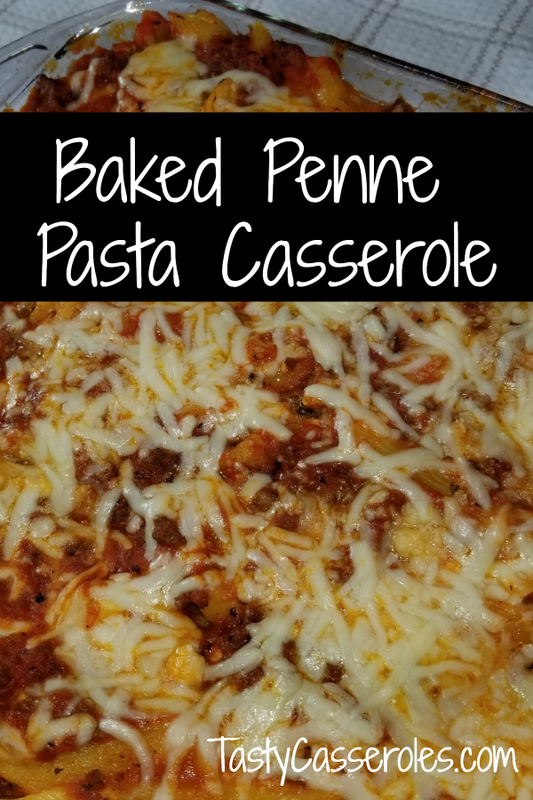 This delicious baked penne pasta recipe is easy to put together and is a great alternative to lasagna. This delicious pasta dish goes well with salad and garlic bread. Preheat oven to 350 F. Spray 13"x9" casserole dish with cooking spray and set aside. Brown ground beef or sausage until no longer pink, drain excess fat. Add pasta sauce and heat through. Cook penne pasta according to package direction until el dente (you want the pasta a little firm since it will continue cooking in the oven). Drain and return to pan. In a small bowl, combine 1 cup of the mozzarella cheese with 1/4 cup Parmesan cheese. Refrigerate until needed. While pasta is cooking combine the cottage cheese, the remaining mozzarella and Parmesan cheese, the beaten eggs, Italian seasoning and salt. Pour cheese mixture into cooked pasta and stir to combine. Spread 1/3 of the sauce on the bottom of the casserole dish. Top with 1/2 of the pasta mixture. Repeat with 1/3 of the sauce and top with remaining pasta mixture. Spread remaining sauce over pasta mixture. Cover dish with aluminum foil and bake for 40 minutes. Uncover, top with remaining cheese mixture and bake 10 minutes or until cheese is melted and pasta is bubbly. By the time I finished layering the ingredients my casserole dish was quite full but it did all fit without spilling over. Since you leave it uncovered after topping with the remaining cheese you wont have to worry about the cheese sticking to the foil. If you are worried that your dish is too full you could put some of it into a smaller casserole dish. If you decide to use ricotta cheese then simply use the same amount as you would the cottage cheese. I used a large, 32 ounce jar of pasta sauce (the standard size is usually about 24 ounces). Any sauce will do but you will want about 3 1/2 cups. The brand that I used was Classico Sweet Tomato Basil but your favorite brand will do. If you are looking for more tasty casserole recipes then check out these 5 ingredient casserole recipes.